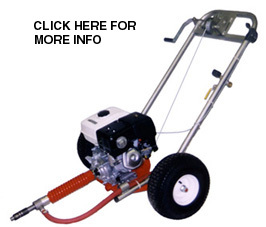 Capabilities: Earth boring small holes under sidewalks and driveways in easy to clay soil conditions. 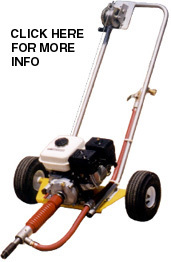 Capabilities: Earth boring 2" to 6" (5-15cm) in diameter in soft to medium soil conditions 100' (33m) in length. Winch driven. Capabilities: Earth boring 2" to 13"(5-33cm) in diameter in soft to hard rock soil 200'(66m) in length. Culvert cleaning up to 24" in diameter.Winch driven. 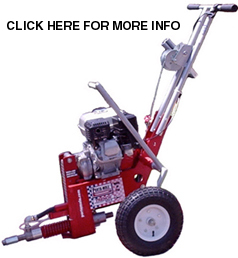 Capabilities: Earth boring 2" to 6" (5-15cm) in diameter in soft to medium soil conditions 100' (33m) in length. Winch driven. Core boring through brick, stone, concrete and curbs. Winch driven. Capabilities: Earth boring 2" to 13"(5-33cm) in diameter in soft to hard rock soil 200'(66m) in length. Culvert cleaning up to 24" in diameter. Core boring through brick, stone, concrete and curbs.Winch driven. Capabilities: Earth boring 2" to 16"(5-40cm) in diameter in soft to hard rock soil 200' (66m) in length. Culvert cleaning up to 30"in diameter. 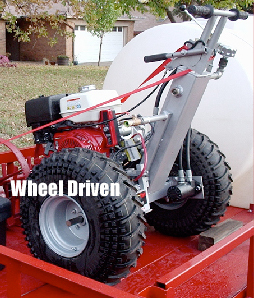 Wheel / Winch driven.